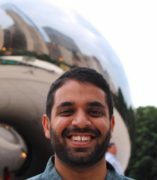 Rahim Kurwa is an Assistant Professor in the Department of Criminology, Law, and Justice and Department of Sociology (by courtesy) at the University of Illinois at Chicago (UIC). He is also a faculty fellow at UIC’s Institute for Research on Race and Public Policy. His work is focused on understanding how municipalities reproduce racial segregation in an era governed by fair housing law. His book project, Grounds for Eviction: Race, Mobility, and Policing in the Antelope Valley uses qualitative and quantitative methods to illustrate how a Los Angeles suburb uses the criminalization and policing of the Section 8 Housing Choice Voucher program as a means to evict Black residents. His work has received awards from the American Sociological Association and Society for the Study of Social Problems. More broadly, he is interested in understanding the family implications of the policing of housing assistance, the interrelatedness of policing and segregation, and the history of policing in public housing and its successor programs. He received his PhD in Sociology from the University of California at Los Angeles in 2018.